​The first ever My Shawlands Car Boot Sale was held on Sunday November 25th. We managed to collect a whopping 158 kg of food for the Glasgow South East Foodbank so well done to those who 'Brought a tin to get in!' 158 kg is an amazing amount of food, according to the internet its 0.00000000000000000000003 the weight of earth which is not bad we say! A very big thank you again from everyone at My Shawlands to everyone who made the effort to bring down a tin and the sellers that pitched up at 7am on a crisp sunday morning, and finally Goals Glasgow South who hosted us and helped make this all possible. In October we had our first AGM followed by a meeting, open to all businesses and organisations in the business improvement district. This video shows our journey so far, highlighting some of the projects that have been fulfilled from the business plan. We also look to 2019 and what is planned for the next year, we welcome your ideas so please get in touch. Changeworks Recycling is delighted to be appointed as the preferred supplier for waste and recycling in the My Shawlands BID. By using our services businesses in the city centre have received a hassle-free service without the worry of putting waste on the streets and potential fines. We are experienced in providing innovative solutions for businesses of all types and sizes. The Council is changing its procedure for the way businesses put their trade waste containers out on public spaces. 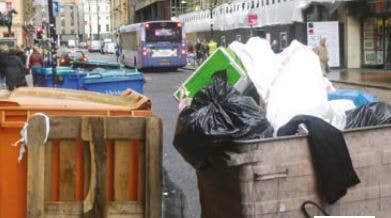 Trade waste will only be allowed on the streets at certain times of day. This means you will need to store your business waste in your own premises or land and then put it out for collection during a pre-arranged time slot. Please see the links below for more information. As part of the Playing Out Initiative we managed to secure a free road closure from GCC for the Skirving Street Fair on the 24th June. We had a fantastic day with a bouncy castle, hula hoop workshops, punch & Judy shows, face painting, giant outdoor games and entertainment by Goals and Pure Gym. It was a fabulously sunny day and it was great to see the cafes full and local shops busy. Carment Community ​Group hosted an amazing Shawlands Street Party on Saturday 23rd June with live music, food, stalls and crafts for the kids. This event raised money towards heritage lighting for Carment Drive and brought many visitors to the area. To help improve the overall appeal and appearance of Shawlands the BID have launched the Shopfront Improvement Grant. With the Farmers Market at Langside Hall on hold until the Civic Square has been completed we were delighted about the launch of Park Lane Market with an interesting range of stalls including food, clothing, coffee, jewellery, art and much more. With a laid back vibe, fairy lights and tunes in the background this will be a real asset to Shawlands. To celebrate the switch-on of our new lights we had some festive fun with Santa and his reindeer visiting Shawlands. They were joined by The little Fawn Caravan Theatre, face painters, bubbles the clown, balloon modelling along with craft activities and glitter tattoos for the kids. It was a fun evening with many businesses taking part handing out goodie bags, reindeer dust and refreshments. We were very lucky to have choirs from Shawlands Primary and Langside Primary join us for some songs around the Christmas Tree. It was a very cold night however the kids and teachers did a great job, a big thank you to everyone who took part including Shawlands Kirk and Destiny Church who opened their doors and provided refreshments. Brass, Aye? played some tunes while others danced around the tree. At last Shawlands has seasonal winter lights. We are delighted with the feedback regarding the lights throughout Shawlands and look forward to their return next year. We intend to extend the lights into Minard Road in 2018, this was put on hold last year as we are still waiting for permission from the owners of one of the buildings. Pay as you go bikes have arrived in Shawlands near Langside Hall. From just £1 you can hire a bike for a ride around the park.